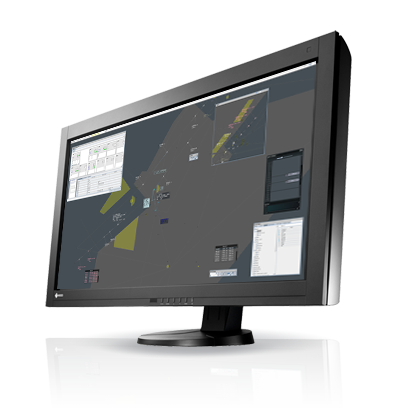 The EIZO DuraVision FDH3601 features a 4K x 2K resolution across a 36.4" screen. It is ideal as an ATC primary control monitor or for use in geophysical services. The DuraVision FDH3601 displays 8.8 megapixels (4096 x 2160 native resolution) across its 36.4-inch screen. This is enough pixels to display the content of several desktop monitors but without the distractive bezels between screens. The DuraVision FDH3601 ideal for fields like air traffic control and geophysical services requiring large monitors that can display a high volume of information. 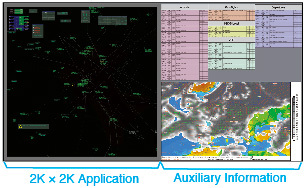 The DuraVision FDH3601 enhances EIZO's selection of primary control monitors for ATC by offering new ways of displaying information. For example, it can display one 4K x 2K image across the entire screen or it can display a 2K x 2K image and auxiliary information simultaneously. Using the latest white LED backlight technology the DuraVision FDH3601 offers a brightness range from 30 cd/m2 up to 700 cd/m2, making it ideal for almost any ambient lighting environment. With an extremely tight pixel pitch of 0.1995, text and images such as contours on a map can be displayed in fine detail. The tight pixel pitch allows the monitor to display the equivalent of four full HD monitors on its 36.4-inch screen without bezels to divide the screens. 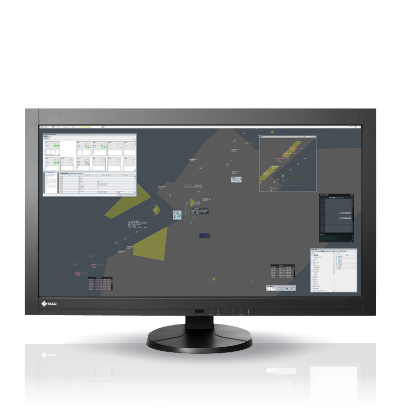 EIZO's EcoView Sense feature unites convenience with energy savings by ensuring that the monitor automatically conserves power when it is not in use. EcoView Sense is an integrated presence sensor that prompts the monitor to switch to power save mode when it detects your absence, and then resume normal operation when you return. To prevent the screen from reactivating when it shouldn't, EcoView Sense differentiates between your presence and a still object like an empty chair or general office activity in the background. When the monitor is switched off via its AC adapter's main power switch it consumes no electricity at all. The DuraVision FDH3601 includes two dual-link DVI-D and two DisplayPort connectors for connecting to up to four computers. A USB hub with one upstream and two downstream ports is also included. A 16-bit look-up table offers a palette of about 278 trillion colors from which the most appropriate 16.7 million are displayed. This produces smooth reproduction of color and grayscale tones. Furthermore, with the DisplayPort inputs, the monitor can display simultaneous 10-bit color *. This is more than 1 billion colors shown simultaneously which is 64 times greater than the 16.7 million colors of 8-bit display. The result is even smoother display of gradations and reduced Delta-E between two adjacent colors. A graphics board and software which support 10-bit output are also necessary for 10-bit display. The DuraVision FDH 3601 comes with EIZO's ergonomic FlexStand 2. It offers very versatile positioning with 100 mm height adjustment, 25° tilt, and 344° swivel. The monitor can be removed from the stand and mounted on a VESA-compatible arm or wall mount. An on-screen button guide appears above the buttons to indicate what each one is for. This is convenient when using the monitor in a dimly-lit working environment. Furthermore, the brightness of the power lamp can be adjusted in eight stages including shutting off the lamp. The white LED backlight provides very stable brightness even at low settings like the monitor's minimum brightness of 30 cd/m2. Unlike a CCFL backlight, an LED backlight is mercury free so it will have less impact on the environment when it is disposed of. The DuraVision FDH3601 uses an LCD panel that has viewing angles of 176° and exhibits minimal color shift so two or more people can view the screen at once. Five preset modes are included: sRGB, Text, and three customizable modes where users can input their preferred values for brightness, color temperature, and gamma. with any inquiries about purchasing or technical support. Copyright (c) 1996-2014 EIZO Corporation. All Rights Reserved.